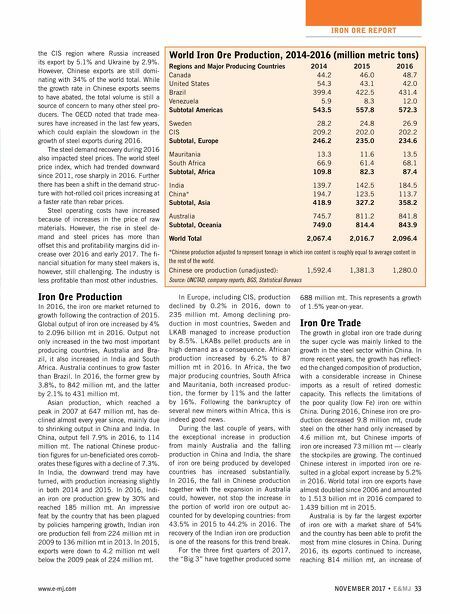 IRON ORE REPORT 32 E&MJ • NOVEMBER 2017 www.e-mj.com Iron ore prices have held up surprisingly well in 2017. The strong U.S. dollar in early 2017 helped many miners operat- ing in countries with weaker currencies to additional income. Producers in the high-quality end of the iron ore market further benefitted from large and growing premium paid for these products. Economic growth strengthened some- what in developed countries and in China in 2016. World crude steel production also in- creased in 2016 by 0.6%. The increase in production was an improvement compared to the decline of 3% in 2015. Noteworthy is the increase in crude steel production in India where production rose 7.4%. Chinese crude steel production de- creased in 2015 for the first time in de- cades, but in 2016, production increased by 0.6%. At 808 million metric tons (mt), China continues to be, by far, the largest producer. In 2016, roughly 50% of total world crude steel was produced in China almost exactly the same proportions as the year before. According to the Organization for Eco- nomic Cooperation and Development (OECD), the world's steelmaking capacity increased from a level of 1,050 million mt to 2,390 million mt between 2000 and 2016. Meanwhile, steel production, according to the World Steel Association, over the same period rose from 848 million mt to 1,620 million mt. This suggests that the overcapacity has risen from 202 million mt in 2010 to 770 million mt in 2015. This equals to a utilization rate of 81% in 2000 compared to 68% in 2016. Last year (2016), crude steelmaking capacity increased by 30 million mt per year (mt/y). Global steel exports remained relatively flat during the year. According to OECD es- timates, world exports were 314 million mt in 2016 down from 317 million mt. The exports of many countries declined, China by 3.1%, Japan by 0.7%, the European Union (EU) by 12% and Korea by 1.8%. This was partially offset by the growth in Iron Ore Market Report 2017 Prices and demand for high-quality iron ore increases. 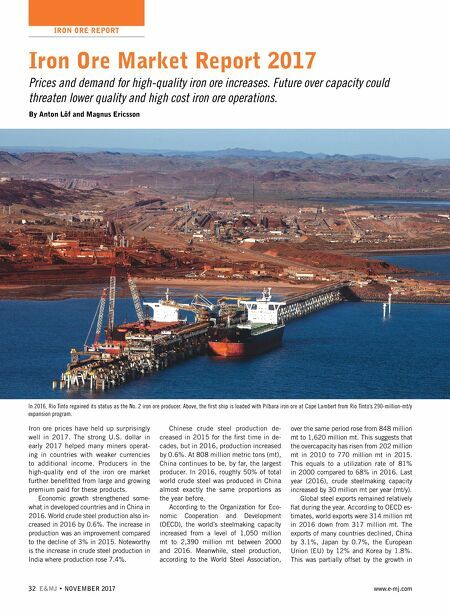 Future over capacity could threaten lower quality and high cost iron ore operations. By Anton Löf and Magnus Ericsson In 2016, Rio Tinto regained its status as the No. 2 iron ore producer. Above, the first ship is loaded with Pilbara iron ore at Cape Lambert from Rio Tinto's 290-million-mt/y expansion program.